Malin + Goetz will launch two new unisex fragrances, Citron Vert and Moroccan Fig. Citron Vert ~ "Our fresh, effervescent citron vert eau de toilette synthesizes citrus, floral and woody notes for a unique aromatic blend and perfect sensory balance." With bergamot, lime, grapefruit, basil, jasmine, rhubarb, petitgrain, orris, amber woods, white cedar and skin musk. Moroccan Fig ~ "A modern interpretation of a classic scent, our moroccan fig is the fusion of fresh bergamot, milky fig and earthy notes of cedarwood and bark. This unique fragrance is evocative of the mediterranean coast, conjuring the sweet and subtle aroma of fig." With bergamot, fresh leaves, green pepper, fig leaves, white fig pulp, fig bark, cedar, coconut and musk. 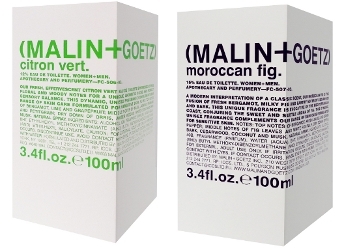 Malin + Goetz Citron Vert and Moroccan Fig will be available in 100 ml Eau de Toilette, $150 each.